Mladic and Bin Laden: which solution is just? They couldn’t believe their luck. Finally, after all those years on the run, the Serbs got their man. Ratko Mladic was indicted in 1995 by the International Criminal Tribunal and was recently arrested after a tip off. Mladic stands accused of the murder of at least 7500 Muslim men and boys from the town of Srebrenica. This is considered the single biggest atrocity since World War II. Having watched footage on the news this morning there seemed joy by many that he had been arrested, but unlike the killing of Osama Bin Laden, there was no hysterical dancing on the streets as there was in the US when news of that killing broke. The total number killed as a result of all the attacks on America on 9/11 were close to 3000. There are no winners in acts of terror on innocent civilians and the world is a better place now that both have finally been caught up with. However, the killing by Ratko Mladic and his henchmen of 7500 Muslims never received the same media attention as Osama Bin Laden’s attacks on the US, even though the number killed by Ratko Mladic was far greater and surely on equal level of cruelty suffered of those killed by Bin Laden. The siege of Sarajevo resulted in the deaths of at least another 10 000 people. The relentless shelling of this beautiful historical city of was encouraged by Mladic, who was reported as ordering, “Shell them till they go mad”. One has to go back to World War II to find the equivalent. There is, however, a stark difference by which both came to their final moment of justice. One was killed outright followed by jubilation and cheers by thousands of enthusiastic people, mainly Americans. It was seen as fair justice. Not many expressed concern that the shooting dead of Osama, in the head ,was done in front of his twelve year old daughter. Amnesty International was less enthusiastic, and was critical of this peculiar US method of justice, as OBL was unarmed and in bed, at 1am. Amnesty raised concerns that there was no attempt to capture him alive, and stressed the necessity to adhere and comply with international Law in such situations. Ratko Mladic on the other hand was arrested in a pre-dawn raid on an isolated farm, without any violence. He was immediately brought before a judge. A few elderly women were interviewed just after the arrest of Ratko and were shown to still grieve for their sons and husbands. The difference could not be more startling. While America has always been associated with guns, violence and seeking retribution whenever possible, no more so than in the cold blooded killing of OBL, at least the Serbs have displayed remarkable resistance to acting in the same way. 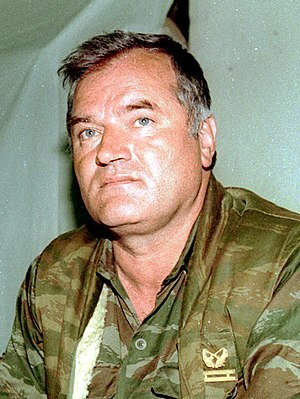 Mladic is reported to have had two loaded guns but like Bin Laden, offered no resistance. There are still many Serbs who consider Mladic a hero. The Serbian Government was repeatedly requested to implement his arrest but fearing a backlash, was somewhat less than enthusiastic. The big stick of refusing Serbia’s entry to the EU was effectively wielded by the European Union, finally persuading the Serbian Government to act. No doubt the world can give a well-earned sigh of relief that another monster has been caught. Unlike the US action against Bin Laden, the world will experience the process of bringing such a monster to justice when Mladic is tried in The Hague.